A new study found that the biofuels used to power jet engines can help to reduce particle emissions in their exhaust by nearly 50 to 70%, and this could influence airline economics and Earth’s environment. The findings, published in the journal Nature, are the result of a collaborative international research program headed by NASA and involving other agencies from Canada and Germany. During the 2013 and 2014 flight tests conducted near NASA’s Armstrong Flight Research Center in Edwards, California, large amounts of data was collected to measure the effects of alternative fuels on aircraft-generated contrails, engine performance, and emissions at altitudes flown by commercial airliners. These tests were part of the Alternative Fuel Effects on Contrails and Cruise Emissions Study (ACCESS). Contrails are generated by hot aircraft engine exhaust mixing with the cold air at cruise altitudes several miles above Earth's surface, and they are mainly made up of water in the form of ice crystals. These contrails are of particular interest to the scientists because they form long-lasting, and sometimes huge, clouds that would not usually form in the atmosphere, and it could be a factor in influencing Earth’s environment. Soot emissions also are a major driver of contrail properties and their formation. As a result, the observed particle reductions we’ve measured during ACCESS should directly translate into reduced ice crystal concentrations in contrails, which in turn should help minimize their impact on Earth’s environment. This is very important because contrails and the cirrus clouds that form from them have a bigger impact on Earth’s atmosphere compared to all other aviation-related carbon dioxide emissions since the first flight by the Wright brothers. 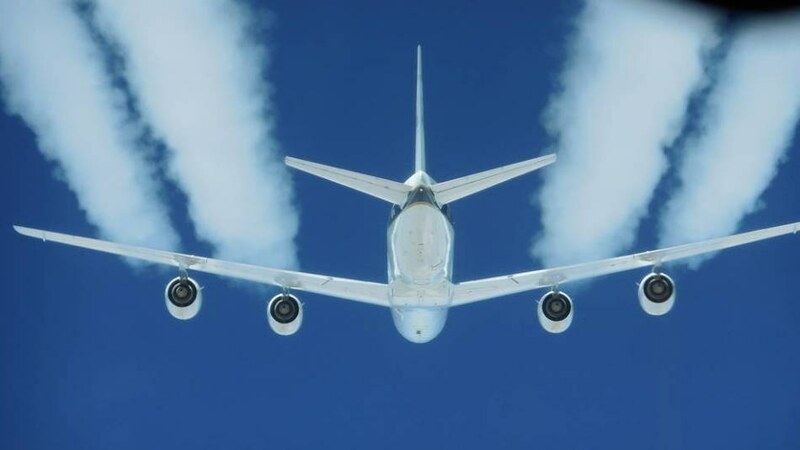 During the tests, NASA's workhorse DC-8 with four engines flew as high as 40,000 feet with a 50-50 blend of a renewable alternative fuel of hydro processed esters and fatty acids generated from camelina plant oil and aviation fuel. Three research aircrafts flow behind the DC-8 at distances ranging from 300 feet to over 20 miles in order to take measurements on emissions and explore the formation of contrail as the different fuels were burned. This was the first time we have quantified the amount of soot particles emitted by jet engines while burning a 50-50 blend of biofuel in flight. NASA's HU-25C Guardian jet based at Langley, a CT-133 jet provided by the National Research Council of Canada, and a Falcon 20-E5 jet owned by the German Aerospace Center (DLR) were the trailing aircrafts. Measurements in the wake of aircraft require highly experienced crew members and proven measuring equipment, which DLR has built up over many years. Since 2000, the DLR Falcon has been used in numerous measurement campaigns to investigate the emissions and contrails of commercial airliners. Scientists also plan to continue these studies in order to understand and show the potential benefits of replacing existing fuels in aircraft with biofuels. This is NASA’s aim to demonstrate biofuels on their future supersonic X-plane.